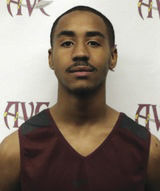 Leader — Antelope Valley College’s Julian Payton led his team with 17 points in an 86-85 loss to Santa Monica at the Gregg Anderson Memorial Tournament on Friday. LANCASTER — Free throws aren’t always free. They proved very costly for Antelope Valley College in its opener of the 67th Annual Gregg Anderson Invitational Tournament. The Marauders made only 4-of-10 free throws in the last three minutes and fell to Santa Monica College, 86-85 on Newton Chelette Court. Rubbing salt into the wound, AVC had three cracks at the basket in the final 18 seconds. One was blocked, another misfired and the buzzer precluded Dion Troupe’s tip-in from counting. “Our free throw shooting made it closer than it needed to be there at the end,” said AVC coach John Taylor, whose team slipped to 2-5 on the season. “Our plan was to take it right to them, because they had a tendency to foul. Conversely, the Corsairs (4-3) executed beautifully on offense. When AVC pressed, and later trapped, SMCC moved the ball expertly and found one player after another open for a layup. Showing remarkable balance, Teddy Parham, Jordan Wilson, Leandrew Knight and Kyle Young shared scoring honors with 15 points each. Daisone Hughes added 10. AVC burst to a 22-13 lead in the game’s first 11 minutes as defensive pressure produced five turnovers that led directly to 10 points. The visitors clawed back to lead 39-37 at halftime. The teams were tied five different times before Santa Monica sank four consecutive layups in the final three minutes. Julian Payton, the only Marauder to make two consecutive free throws down the stretch, finished with an AVC-high 17 points. Stephon Bell worked mainly inside for 16 points and 11 rebounds, Elie Ghomsi had 15 points and Surako Follings Jr., 14. Gianni Brown scored 11. AVC will play Rio Hondo, a 79-76 winner over Mira Costa, today at 7 p.m. The reconfigured round robin format also pits Santa Monica and San Bernardino at 3 p.m. today. Ventura, a one-point winner over San Bernardino in a game in which the Pirates trailed by 18 and did not take their first lead until the final minute, will meet Mira Costa at 5 p.m.